Eight players entered. None was new to these events: MCark last competed in October 2010, and NiceGo19N is a version of oakfoam. At the start of round 1, ManyFaces1 joined its game with NiceGo19N, but did not play a move. Its operator needed to reboot it, and it eventually rejoined its game nine minutes late. It still won. In round 3, pachi2 and Zen19, the only undefeated players, played each other. Pachi2 won a semeai, saving its large left-side group by killing Zen19's top left corner. 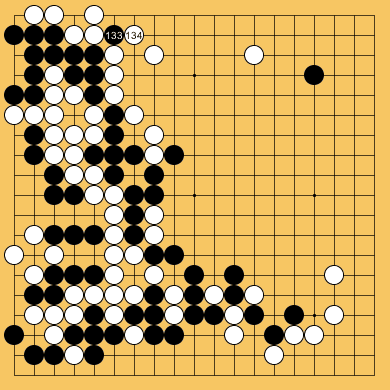 In the position shown to the left, pachi2 as White is well ahead. Moreover, both players knew this: move 133 is a move typical of a Monte-Carlo program in a hopeless position, achieving nothing but strongly sente, while pachi2 stated that its "winning probability" was 65% (which normally means that its true probability of winning is over 80%). At move 135, pachi2 had 12 minutes left, while Zen had 15½, so pachi2 should not have been under much time pressure. However, by move 213, pachi2 had only five minutes left, while Zen19 had ten minutes. It was now pachi2 that was acting as if its position were hopeless, making move 214 as shown in the diagram to the right. Pachi2 may still have been winning at this point, but it continued making poor moves, and lost the game. Also in round 3, ManyFaces1 crashed in a totally won position, with all dame points filled, against MyGoFriend. It failed to finish the game, and lost on time. 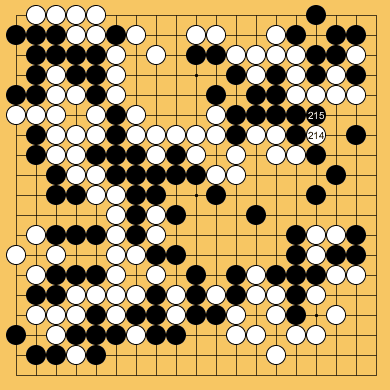 In round 4, ManyFaces1 had been rebooted again, and started its game with Orego12 on time. ManyFaces1 won this game. In round 6, pachi2 chased and killed NiceGo19N's stones in a simple ladder, and won the game. In round 8, NiceGo19N chased AyaMC's stones in a ladder, despite AyaMC having a ladder-breaker. AyaMC won this game. Aya, running on 6 cores of an i980X, at 3.3GHz. Many Faces of Go, running 4 cores (8 threads) of an i7-2600. MyGoFriend, running on a 20-core system: two i7s each with 6 cores and two i7s each with 4 cores, all about 3.3 mhz. pachi, running on 64 platforms, each x86 64 bits, 32 GB ram, using 22 cores of each (total 1408 cores), giving about 1500 playouts/s/core at the beginning of a 19x19 game. Zen, running 46 on a Mac Pro 8 core, Xeon 2.26GHz.